Agents of the Judicial Police of Ibiza’s Civil Guard have arrested four people for their alleged connection with the disappearance of Nuria Escalante, an Ibiza worker from Alicante. The Civil guard have only released limited information – that 4 men of non-Spanish nationality have been arrested. However, the arrests follow searches by Police in the area of a campsite near San Antonio. Earlier they were searching in a squat and some vacant lots. 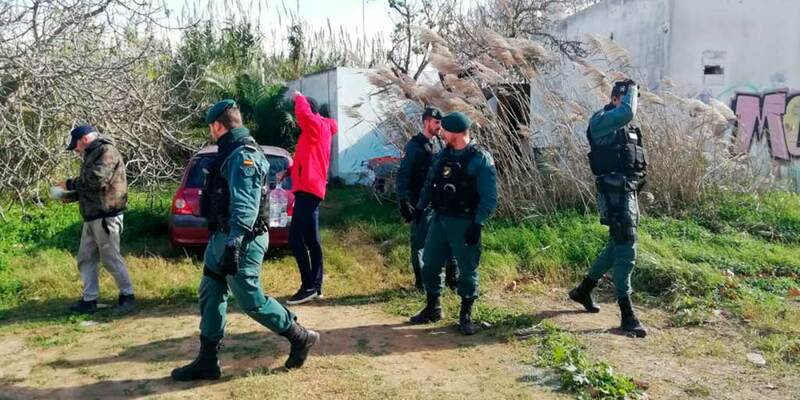 Yesterday, several agents of the Civil Guard carried out a series of searches in house being used as a squat and in some vacant lots in San Antonio. It was confirmed that they were looking for evidence in connection with the disappearance of the woman who had come to work in Ibiza. Nuria Escalante, aged 52 and from Alicante, had first stayed at the home of a friend of one of her children. They have since told the family that they have not seen or heard from her since the end of October. Escalante has worked in Ibiza in previous years in the hospitality sector and also as a airport security guard. About two weeks ago, after days of searching for the woman, the Civil Guard investigators found Escalante’s belongings in the house of a person she had left them with for safe keeping, saying she would return to collect them, though she never did.